Wipro, India's third-largest information technology services company, has appointed two insiders as its chief information officer and head of global operations. Both these roles were handled by Laxman K Badiga, who took 'voluntary retirement' earlier this month after over three decades of service. The company elevated Ramesh Nagarajan, who was the chief operating officer of Financial Solutions in the banking, financial services and insurance division of Wipro Technologies, as its CIO. Similarly, it brought back Hariprasad Hegde, who was heading Wipro Water, as its global head of operations. with the acquisition of Aquatech, a water treatment firm. 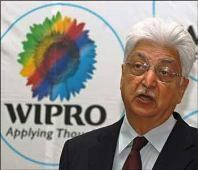 The water business is a part of Wipro Infrastructure Engineering, which accounts for less than four per cent of the company's overall revenues. Meanwhile, Badiga, 56, has joined Dallas-headquartered Anthelio, an IT solutions provider, as its COO. A post graduate from Indian Institute of Technology, Kanpur, Badiga joined Wipro in 1981. During his tenure at Wipro, Badiga initiated the first verticalisation of the company by launching the retail and utilities business groups. In his new role, he would continue to be based out of Bangalore, Badiga told Business Standard.